For example sake, we will set our training room camera to take a video clip when it detects nearby motion. 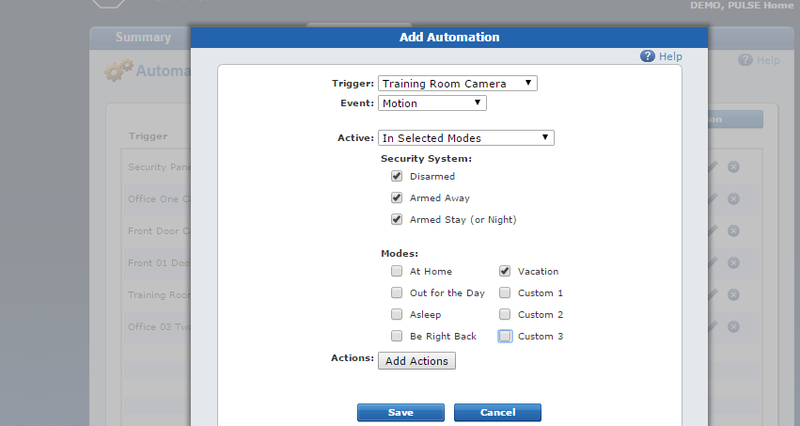 For "Action" Select "Capture a clip from the training room camera" from the pull down menu. To recap, you have assigned an automation to the training room camera. When the "event" of it detecting motion happens, it will always capture a video clip. So you have decided you only want the camera to capture a video clip when you are on vacation. We go back to where it asks when you want this automation "Active." Instead of selecting "Always," select "In selected Modes." then only select "Vacation Mode." For this example, we have chosen for it to happen no matter what the arming status of the system is, one might also choose to only have this happen if the system is armed. Using automations is the basis of the Home Automation industry. Use your Pulse system to instruct your home exactly how you want it to respond and exactly when you want it to do. If you are not yet experiencing the advantages of an ADT Pulse system, give us a call at 1-800-310-9490 for more information, or set up a FREE security review and see how surprisingly affordable home automation can be.